Upon arrival at the airport receive a warm welcome from one of our representatives and get transferred to Pattaya which takes two hours to reach it. Check into the pre-booked hotel after completing all the formalities and enjoy rest of the time at leisure activities with dinner and overnight stay at the hotel. On the 2nd day of your Bangkok Pattaya Package, enjoy the scrumptious breakfast and get transferred to the speed boat to reach the Koh Lan, a small Thai island off the coast of Pattaya in the Gulf of Thailand. It is renowned for its pristinely beautiful beaches set against the backdrop of wooded hills. It has six main beaches and a few smaller beaches for visitors to enjoy. Visitors can indulge in various sporting activities like parasailing, water scooter, banana boat ride etc or visit the various restaurants that offer amazing seafood. Return back to the hotel for dinner and overnight stay. Today after breakfast check out from the hotel and drive towards the capital city, Bangkok. Upon arrival check into the pre-booked hotel and take some rest. Later on, explore the city on your own or indulge in leisure activities with dinner and overnight stay at the hotel. After breakfast proceed for the sightseeing tour of Bangkok which is the capital and the largest city of Thailand known for ornate shrines and vibrant street life. Visit the major historical attraction of the city the Grand Palace and then proceed to visit Wat Pho the oldest temple in the city known for the Temple of Reclining Buddha, then visit the Wat Traimit, Temple of the Golden Buddha and then Wat Suthat which is one of the oldest and beautiful Buddhist temples of the city. Later in the evening visit the Chatuchak Market which is a perfect place for shopaholics to buy everything from jewelry to religious icons to delicious street food. Return back to the hotel for dinner and overnight stay. On the last day of your Thailand Package from India, check out from the hotel after breakfast for the return journey. Thailand is truly spectacular. It is a wondrous kingdom which is decked with mesmerizing islands, Buddhist temples, exotic wildlife, fascinating history and unique cultural heritage. 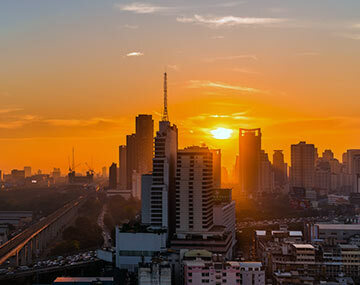 It features a modern capital city Bangkok and friendliest people who epitomize it as the “Land of Smiles”. So pack your bags now and book Thailand tour package to visit a friendly fun-loving, exotic tropical country which surely take your breath away. Plan your next vacation and let BookOtrip can tailor your package to fit your special requirements. Whether you are on a business trip or want to enjoy a family holiday, or planning an adventurous trip with your friends we can help you to design a perfect vacation. So just don’t wait for your dream vacations, it is just a click away. GST 5% Extra on the Total billing. Rate is calculated as per the current ROE+1 INR at the time of payment. If the guest fails to catch SIC transfers he has to arrange his own private transfers because no SIC transfers wait for more than 05 minutes. Rooms and rates are subject to availability at the time of booking. Check-in 15:00 hrs/Check-out time is 12:00 hrs. The hot destination Thailand was there in bucket years before. We were in search of an affordable package to Thailand. At last reached bookotrip and had memorable trip to Thailand with bookotrip. Thanks guys for your services.